As announced previously, the AAO-HNSF’s otolaryngology-specific clinical data registry, RegentSM, has been approved as a Qualified Clinical Data Registry (QCDR) by the Centers for Medicare & Medicaid Services (CMS). Regent is a Member-only benefit and is the first and only such registry in the field of otolaryngology-head and neck surgery. Expected to be available later this summer, Regent will allow participants to report on quality measures for federal and private programs. It will become the foundation for quality improvement and research, define quality for the specialty, and assist Members in meeting requirements for certification and licensure. Patient care is improved as Members engage with their own performance data in Regent and track to national benchmarks. Members will track their progress to more meaningful measures as the QCDR designation affords the AAO-HNSF the opportunity to create up to 30 otolaryngology head and neck surgery-related measures for quality reporting and quality improvement. The AAO-HNSF is moving forward with development of performance measures to address the depth and breadth of otolaryngology-head and neck surgery as discussed later in this article. It’s physician-friendly. With little data entry burden to physicians and staff, patient data will be extracted and incorporated into Regent from a practice’s electronic health record system (EHR), practice management system, or administrative data system. In the future, we anticipate that Regent will assist in the support of maintenance of certification and licensure (MOC/MOL) by our Members with the provision of data to the American Board of Otolaryngology (ABOto) and state licensing boards. Additionally, in coming years, Regent will be able to facilitate post-market surveillance for medical devices. Regent extracts data directly from the practice EHR utilizing the technology of FIGmd, AAO-HNSF’s vendor partner. 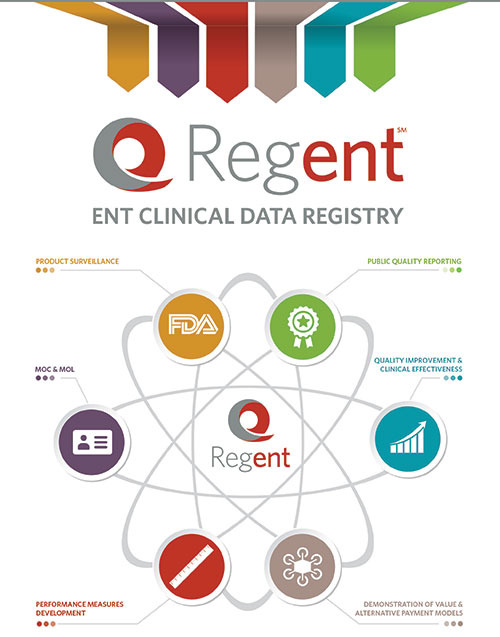 FIGmd installs the Registry Practice Connector (RPC), an application used to access, query, and transfer data from your practice’s data source to the servers supporting Regent. It may be installed on either your practice’s EHR database server or on a computer that has access to your EHR database (or a current copy of the database.) The RPC uses a read-only account to directly access your EHR database and the connection sessions can only be initiated from the practice (and never Regent). The RPC allows Regent a great deal of flexibility in mapping data elements required by the registry and little to no work effort on the part of your practice. Patient/encounter-related clinical data is then uploaded to the HIPAA-compliant Regent data cloud where Private Health Information (PHI) data is separated and securely stored in complete compliance with HIPAA laws and regulations until re-identification is needed for quality submissions to CMS. All data extraction and upload activity is fully encrypted and in compliance with HIPAA. Once installed, your practice will be able to access your own interactive executive dashboard, which will give you and your practice the ability to query performance data, and see performance across different measures for multiple locations and providers. Participating practices can only see their own individual patient-level performance data, which are benchmarked against aggregated data of other Regent participants. Regent is currently in the pilot testing phase with participating practices and is expected to fully launch later this summer. It is critically important that the AAO-HNSF and the specialty societies define quality care for the depth and breadth of the specialty. In 2016, the AAO-HNSF committed resources to the development of outcomes measures to meet eligible professionals’ (EPs) need for quality reporting and for documenting the value of care. In May, individual Clinical Advisory Committees (CACs) for facial plastics, general and sleep, head and neck, hearing and balance, voice and swallowing, pediatrics, and sinus and allergy were created to satisfy the need for meaningful performance measures across the specialty. To ensure the inclusion of meaningful, specialty-specific, applicable measures in Regent, the CACs comprise experts from existing Academy committees, specialty societies, and stakeholder groups such as the ABOto and the Large Group Forum. Each CAC will be tasked with proposing and prioritizing topics for measure development, and will identify current best evidence to support the Foundation’s measure development efforts. In September, CAC Members will convene at the AAO-HNSF Annual Meeting & OTO EXPOSM in San Diego to discuss measure development priorities and commence the important work of developing meaningful performance measures for each otolaryngology specialty. 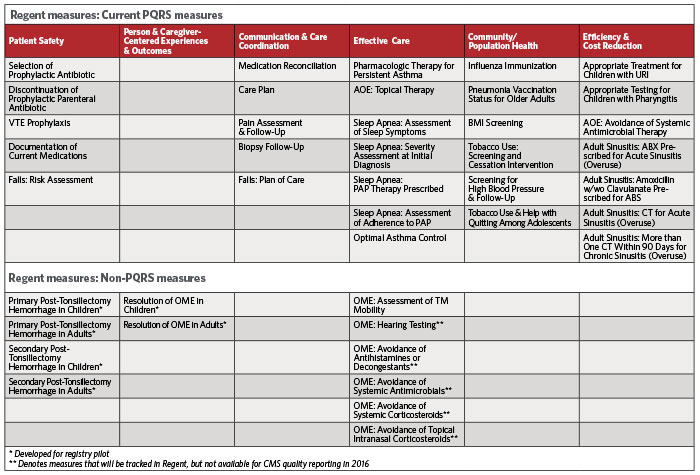 To enable Members to meet the requirements for successful PQRS reporting through a QCDR, the Foundation is pleased to offer six newly developed outcome measures addressing primary and secondary post-tonsillectomy hemorrhage in adults and children and resolution of otitis media with effusion in adults and children. 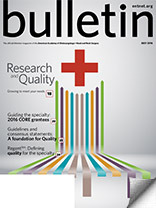 Physicians using Regent to complete PQRS reporting are required to report two outcome measures. In the event that two outcome measures are not available or applicable, EPs are permitted to report at least one outcome measure and at least one resource use, efficiency, appropriate use, patient safety, or patient experience of care measure. Regent contains 42 measures shown in the table below. The AAO-HNSF is constantly looking to the future to ensure Regent addresses not only measures and reporting needs, but that future phases of the registry address research, Maintenance of Certification and licensure requirements, quality improvement, and product surveillance. We welcome you to visit www.entnet.org/Regent to sign up to participate in Regent and to follow Regent developments. We also invite your thoughts and questions. To contact us, send an email to regent@entnet.org. If you are planning on attending the AAO-HNSF Annual Meeting and OTO EXPOSM in San Diego, please stop by the Regent booth.